"DESTINATION: TRANSFORMATION - Your Navigational Roadmap to a Totally Fulfilling, Amazing, And Completely Rewarding Dream Life" is a dynamic on-demand life coaching audio course that is a quick, convenient, and easy method to jump start your journey towards the transformation that you desire to see in your life. These products are for those professionals who want an accelerated transformational process and can choose to work individually at their own pace. These are 12 dynamic sessions are guaranteed to give you results fast if you do the work necessary that is outlined in each navigational direction of the course. Package includes a/v files, BONUS downloadable MP3, PDF materials and Action Steps worksheets, and limited email access for a limited time only. During this ecourse you will travel down the roads necessary to totally transform your life. TOTAL LIFE CONSULTANCY, LLC DISCLAIMER Before You can begin the Total Life Transformation Program and your information submitted, You Must Read And Acknowledge The Following Disclaimer. By scheduling appointment or purchasing a service, you are acknowledging that you have read and agree with this disclaimer. 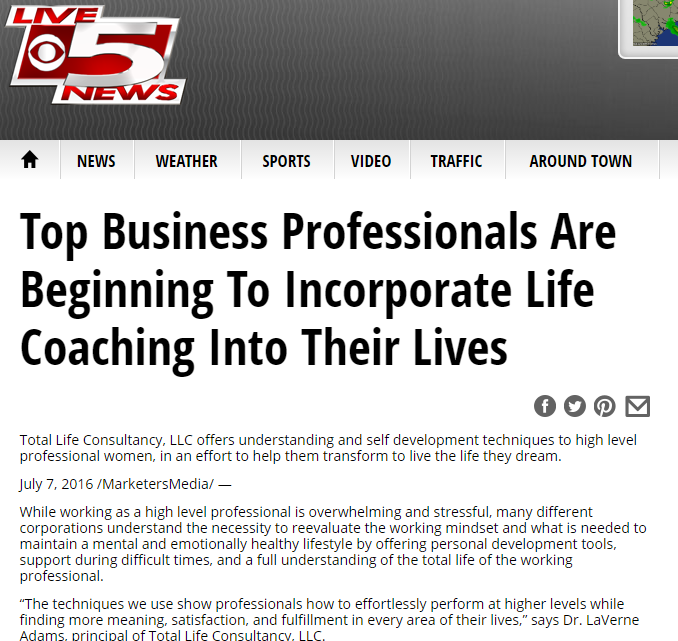 Release of Liability Life Coaching/Consulting is a service that provides personal coaching to specific individuals and/or groups. The client is aware that coaching is in no way to be construed or substituted as psychological counseling or any other type of therapy or medical advice. I will at all times exercise my best professional efforts, skills and care of ensuring my clients are coached to meet their life coaching goals, the client understands and acknowledges the coach will not be liable legally or otherwise, for the actions the client may or may not undertake as a result of the life coaching sessions. No assumption of responsibility is made, or given, and the client requesting such advice agrees not to hold Dr. LaVerne Adams (Provider) or Total Life Consultancy, LLC, responsible or liable in any form or fashion, for such actions taken of their own accord as a result of the information shared during any coaching encounters whether by email, phone, text, or any other communication. The method and process by which this advice and direction are given in no manner whatsoever, written or verbal, constitutes an agreement or liability on the part of the provider and is acknowledged to be different in many ways than clinical and medical counseling. Coaching is effective based upon the use of pertinent information given upon the premise of utilizing the assets of the coached individual in order to make wise decisions to solve their own problems and advance in their own life. You (the client) agree that you are using any of these life coaching services are entirely at your own risk. Life coaching services are provided "as is", without warranty of any kind, either expressed or implied, including without limitation any warranty for information services, coaching, uninterrupted access, or products and services provided through or in connection with the service. This service is requested at the client's own choice and with inherent singular responsibility. Any actions or lack of actions, taken by the client of such advice is done so solely by choice and responsibility of the client and is neither the responsibility nor liability of Dr. LaVerne Adams (Provider) or Total Life Consultancy, LLC. The client takes full responsibility in the decisions they make after being coached as well as the consequences. The client enters into coaching with full understanding that they are responsible for creating their own results. Periodically, I, Dr. LaVerne Adams, may provide links to other web sites or written print material which may be of value, interest and convenience to you. This does not constitute endorsement of material at those sites or any associated organization product of service . It is the responsibility of the user to make their own informed decision about the accuracy of the information at those sites and print material including their privacy policies. In no event shall Dr. LaVerne Adams (Provider) or Total Life Consultancy be liable for any incident or consequential damages resulting from use of the material. Before making any appointments or purchase for service, you certify that you have read and agree to this Disclaimer and take full responsibility for the choices and decisions in your coaching relationship with Dr. LaVerne Adams and Total Life Consultancy, LLC. you further agree to do the following: RELEASE AND WAIVER OF LIABILITY: I, for myself, my heirs, next of kin, personal representatives and assigns, hereby release, waive, discharge and covenant not to sue Dr. LaVerne Adams and Total Life Consultancy, LLC its officers, officials, agencies, employees, its successors and assigns (individually and collectively) For any and all liability, loss, claims, demands, possible causes of action, court costs, attorney’s fees and other expenses arising from any lawsuit that may otherwise accrue from any loss, damage or injury (including death) to my person or property in any way resulting from or arising in connection with, or related to any information received from Dr. LaVerne Adams and Total Life Consultancy, LLC, and arising during pursuit of Dr. LaVerne Adams and Total Life Consultancy, LLC business or personal business, from any cause whatsoever including, without limitation, the failure of anyone to enforce this disclaimer, or the negligence of other persons. ASSUMPTION OF RISK: I thereby assume all risk of loss, damage or injury, (including death), to myself from any cause whatsoever and whether or not attributable to the negligence of Dr. LaVerne Adams and Total Life Consultancy, LLC or others. I understand the risk and danger to myself and property, both from known risk and unanticipated risk, while using the coaching services, and I do so willingly, voluntarily and in reliance, not upon the information furnished by Dr. LaVerne Adams and Total Life Consultancy, LLC, but upon my own judgment and ability, and INDEMINITY AGREEMENT: I hereby agree to indemnify and hold harmless the Dr. LaVerne Adams and Total Life Consultancy, LLC from loss, liability damage or cost, including attorney’s fees and cost of litigation that may incur due to the presence of the undersigned in or about the Dr. LaVerne Adams and Total Life Consultancy, LLC, whether caused by the negligence of the Dr. LaVerne Adams and Total Life Consultancy, LLC, or otherwise. I acknowledge I have read, understand and voluntarily consent to all statements made above, and will solely rely only upon my own personal insurance for any and all claims. I have been meaning to tell you how your event inspired my life! I was driving home from school when I heard you speak about the destiny event on the radio. At the time I was spiritually sick...waking up and being on "autopilot".